Exotic backgrounds, mesmerizing sights… and a mane on your head that looks like it should be on the wild animal photobombing your selfie. Epic. Fail. 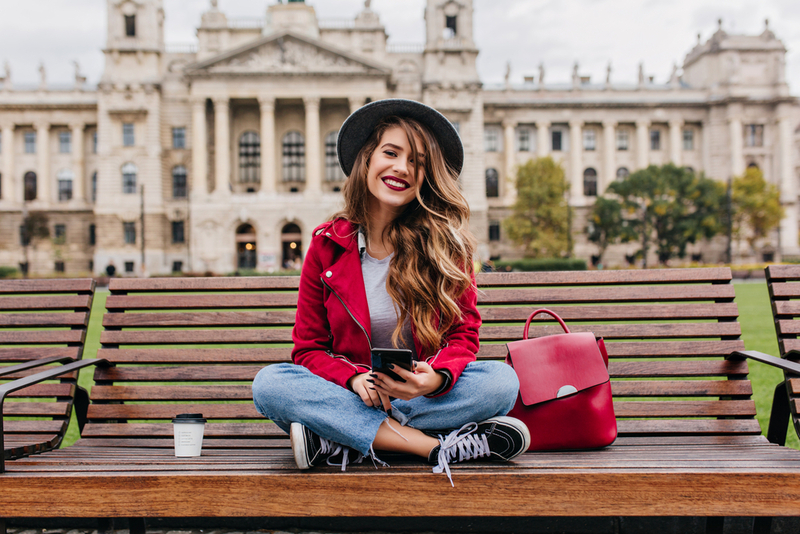 Seeing the world is something we all love to do and you have handy mobile cameras everywhere to capture the moments you want to remember forever. And while that is super duper, it also means that bad-hair-day memories are locked in digital copy as well. But worry no more! Vacation-friendly hair is as simple as can be and needs no electrical devices. Here are five styles to support you in your quest for photogenic hair while traveling. Your pre-packed toiletries bag will be your best travel friend. Brush your hair, so you’ve got no knots or tangles in it. Using your fingers, separate your hair into two sections – top and bottom. Begin braiding the top section of hair. Once you’ve formed the shape of your braid with the upper section, add a small section from the top layer of the lower section. Continue to braid the hair until it has all been braided. Secure your braid with a hair tie. Add some flair by doing two braids, one to each side of your head, or by fastening your hair with a fun in-style hair accessory. Massage coconut oil into your hair. Mess your tangle-free hair up. Comb it tidy at the front, leaving the back messy. Put your hair tie on your wrist and then clutch all of your hair in a messy ball. Secure the messy bun of hair with your hair tie. That’s all, folks! If you want this stylish number to be more pronounced, tease some of the messy hair in the back. Sudden long hair that appears on your social media, getaway snaps will definitely catch the eye of family and friends. For this extension, you don’t need to cut or attach anything. The tool you need is already in your hand. Or, in your hair, rather. Part your hair from the back in two sections: top and bottom. Secure the top section of hair into a high ponytail. Secure the lower section of hair into a ponytail beneath the first ponytail. 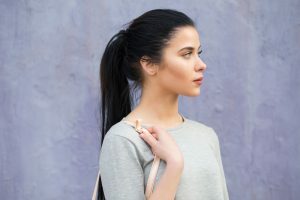 Brush both ponytails in line with each other to hide the lower ponytail tie. Voila! By having split up your hair, you’ve created the illusion that you have long hair in a high ponytail. Imagine snapping a pic on the beach, with the sun on your face, ocean water crashing behind you, and fabulous hair to make the picture shine. Ahh… dreams. Which of these dreamy beaches would you love to take this snapshot on? Big hair makes the hair look thicker and your face appear smaller… or something like that. Whatever the psychology, big hair always remains mandatory in women’s’ fashion. Big hair is almost always achieved with a powerful blow dryer, a round brush, and a lot of hairspray. But when you’re on holidays, these tools aren’t going to be on hand, so working out how to get big out of little is a trick every stylish woman needs to know. Tip to remember when you want to get BIG hair without a lot of products: It’s science – weight is key, as heavier things fall and big hair must go up, not down. Shampoo your hair to remove excess natural oils which will weigh your hair down. Select a shampoo that’s been made specifically for your hair type, and give the most to your luscious locks. Purchase your specialty hair products via dubli.com to earn Cash Back. You know those styles that make the hair look as though it’s naturally fallen into a really fabulous yet casual style? This can be one of those. It is especially ideal for lunch at a beachside restaurant, but it also works well with a scarf while sipping a hot cocoa on your winter getaway. Separate your hair into three sections: a 2-3cm selection on the left side of your hair, the same on the right side, and the remainder is the third section. Brush or comb your hair. Secure the back section of hair into a folded-under ponytail. Starting at the top of the left section, begin to roll your hair backward. Every two rolls, add more hair from the separated hair selection to roll in. When you have rolled the entire selection of hair, wrap it around the under-tucked ponytail. Do the same with the section of hair on the other side. Once both rolls of hair are firmly fastened around the tucked-under ponytail, your hair is ready. Add some flowers or accessories to personalize. Escaping from everyday life and giving yourself the chance to relax is something we all need to do. And that means letting your hair down. 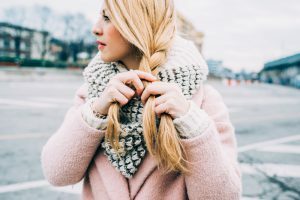 So enjoy your travels, let your hair down as often as possible, and if it needs to have a little bit of a ‘kick, then these five styles are just what you need.